Enjoy the fall colors! 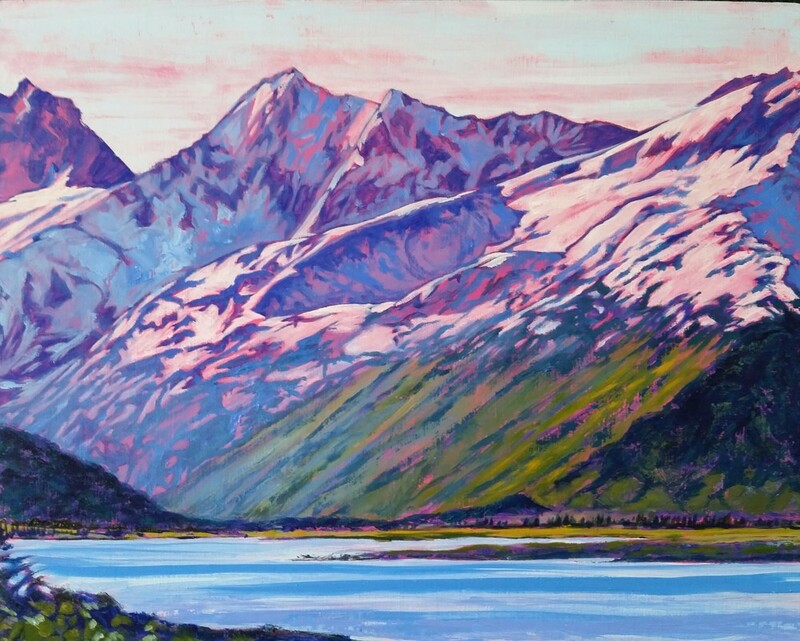 Fall in the Wrangell Mountains offers a spectacular and visually rich environment to study landscape painting. This course will involve both studio painting with field excursions to gather inspiration. Instructor, Rita Pfenninger, will share the process of building a two-dimensional landscape painting by layering vibrant colors. Students will explore the technique of layering oil paint on top of acrylic under layers. Students have the opportunity to critique work in a friendly, intimate group and share work with a small art show on the final day of class. 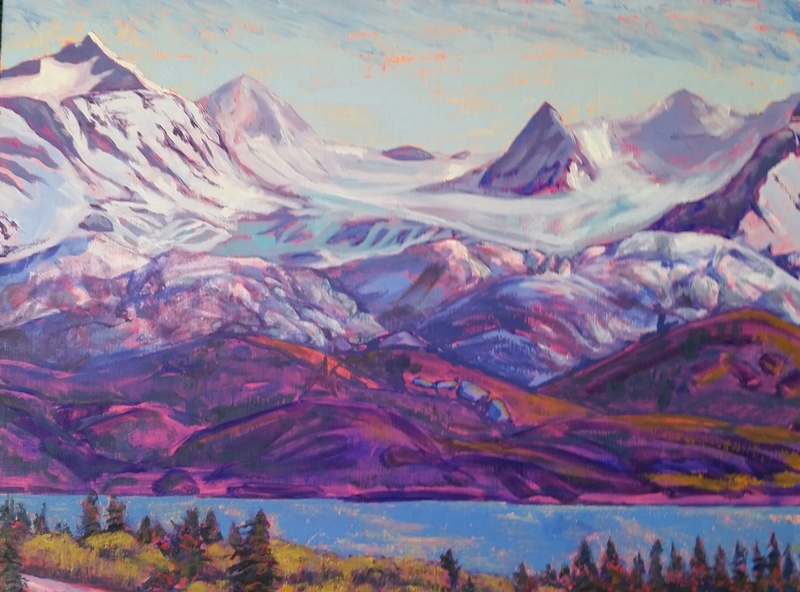 Born in Minnesota, educated in Colorado, and living in Alaska since 1976, Rita Pfenninger has been painting landscapes from a young age. She is influenced by American Impressionism through the Cape Cod School of Art, founded in 1899 by Charles Hawthorne. Her approach to painting is emotional and intuitive, but relies on the subject to provide structure for the expression of her response. Painting in oil enables her to bring to bear strong, saturated color, conveying the rich northern light key as it defines substance. She has exhbited her work in Homer and in Kennicott. Pfenninger begins by drawing carefully from life, memory and photos, noting proportions and value differences that depict three dimensionalities. After transferring her drawing to a brightly-colored canvas, her method shifts to pure joy. At that pivotal point, she loses herself in the painting. Decisions about technique, rate, contrast, texture, etc. occur subconsciously and flow one into another. Color choices, especially, reflect the reverence she has for nature. Participants should plan to arrive in McCarthy in time to get settled and enjoy dinner at 6 pm on Thursday, August 25th. Dinner will be followed by a public lecture at 7 pm. The workshop will end on Sunday evening after dinner with a presentation of artwork. A detailed schedule and a materials list will be provided with the welcome packet upon registration. Our home base, the Old Hardware Store in downtown McCarthy, is a wonderful classroom with plenty of space to spread out and get deep into a project. After a day in class, students can step away to enjoy the vibrant community and inspiring natural landscape, ending the day with a home-cooked meal from the WMC’s gardens, some local music at the Golden Saloon, and a sunset over the glaciated Wrangell Mountains. Lunch and dinner will be provided and shared communally; workshop participants are responsible for the breakfast meal. Breakfast can be purchased from a limited number of local vendors or participants can bring breakfast provisions to store and cook in the Hardware Store facilities. Hot water will be provided for coffee and tea. Every effort will be made to accommodate dietary needs and restrictions with advance notice. Primitive camping is available at no cost to workshop participants. The private site is located just a short walk away from the Wrangell Mountains Center campus. Those who camp are welcome to store gear and food, borrow bear barrels, and use our rustic shower and other facilities at the Hardware Store. WMC staff will direct you to the campsite and orient you there upon your arrival. Other lodging options within McCarthy include the full service McCarthy Lodge and Lancaster's Backpacker Hotel, located just down the street. The Kennicott River Lodge and Hostel is another great option outside of town; it's a short bicycle ride or twenty minute walk each way. If you bring a vehicle with you, Currant Ridge Cabins is located on the McCarthy Road about three miles from the road's end; it's about a half mile walk between the parking area there and the Old Hardware Store. Free shuttles run between the river and McCarthy on a rotation with limited hours. If you bring a camper in or would otherwise like to camp out with your vehicle, there are two commercial campgrounds near the end of the McCarthy Road that will accommodate you without advance reservations. $330 per person. Current WMC Members receive a 10% discount. The workshop price includes one prepared panel and frame, lunches and dinners, and optional camping and food storage facilities. Students will be asked to supply their own painting materials.